Cord cutting is a growing trend, especially among younger consumers. This trend consists of ditching traditional cable providers in favor of digital replacements. Most content is then just streamed to a television or other device via the internet. Insert the AppleTV. 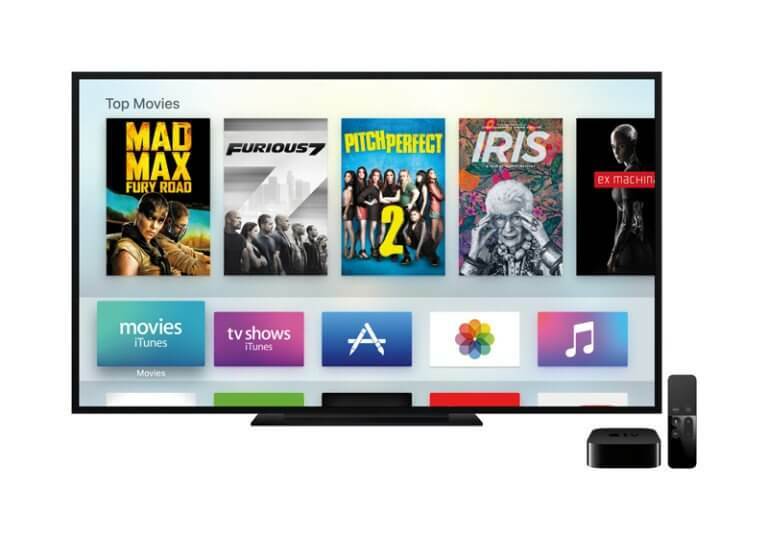 A popular streaming device for the better part of the last decade is the AppleTV. Once a trendsetter in the category, the AppleTV became a hobby for Apple, and saw many years pass without an upgrade. All the while, other products began to popularize the space, such as the Amazon FireTV, Roku, and Google Chromecast. This year though, Apple finally released an updated AppleTV to “revolutionize” streaming tv boxes. We have unboxed and tested the 32GB model. Opening the box reminds you this is an Apple product. The tightly fitting box, once open, showcases the simple product: the set-top box and power cable (HDMI cable not included). It might even be over-stylized, with protective plastic covering the top and bottom logos, along with the shiny black perimeter. Installation only consisted of inserting the power cable, and HDMI cable (once again, not included). Once powered on, pairing of the new bluetooth Apple Remote was as easy as pressing down on the new touchpad. That’s where the simplicity ended. When connecting to the wireless network, entering the password had to be done like all text entry, with an awkwardly designed on-screen keyboard. Letters spanning across the horizon had to be done using the touchpad on the remote, which took quite a bit to adjust to. From there, you also had to awkwardly enter your AppleID and password in the App Store (luckily you don’t have to re-enter for free apps). Adding a paid app? Time to enter your password yet again. Most of the apps use authentication through your computer which is the easiest and most logical way of doing it in my opinion. To activate your ABC account for instance, you enter a simple code on their website. Most apps works this way except for Netflix, in which you must awkwardly enter your account information once again. A real disappointment for a generally forward-thinking company. Once all of your apps and accounts are setup, the user interface honestly hasn’t changed much since the last version of AppleTV. A grid of apps takes up the screen, which is clean and attractive in Apple fashion, but rather unimaginative from a user perspective. This isn’t a huge surprise given the rather unimaginative layout still used on other iOS devices, but to be the “future of television” you would hope for something a bit more groundbreaking. Unfortunately, many of the apps seemed rather buggy, which is more of an indicator of them, not Apple. Some of the channels wouldn’t activate, or after activation would give an error. I have found that after some time, those errors went away, which might have something to do with the communication between the apps and their authentication server. Regardless, it’s annoying for a new product to just not “work” out of the box. The apps are also rather bland. You can tell there is an app developer template, as all of the apps look and function rather the same. It’s clumsy to navigate, and I’ve found some apps get lost within themselves. (I have entered screens where the menu button puts you back to the home screen, not up to the above level in the app, which is excruciatingly frustrating.) I am hoping for some innovation in the overall user interface. However I must say, it’s not all bad. Once you finally get things squared away, it’s by far the quickest functioning set-top box I’ve used. Wakes from sleep quickly, even learning my television through the HDMI connection and automatically turning the TV on, or controlling your volume. When you put it to sleep, it turns off your TV as well. This is very helpful with a growing number of remotes on our coffee tables these days. Siri is by far the best feature of this device, although it is not the full featured Siri you’re used to. A few of her cool new tricks include things like “what did she say?” in which Siri rewinds 30 seconds and temporarily adds subtitles so you can catch what you missed. You can also ask questions about the actors in what you’re watching, to find other shows or information about them. You can even check in on the weather for the week, or the latest NFL score, all without interrupting your show. The only thing I wish for is for Siri’s database on the AppleTV be the same as it is on iOS devices, instead of Siri Lite. If you’re looking to expand your Apple ecosystem by integrating your television with your other devices, this is a great option. If you’re just looking for a streaming device, it’s not really worth the price difference between even the $60 last generation AppleTV (or other devices mentioned above). In other words, if you’re looking for an AppleTV upgrade, go for it. If not, there are many better options out there for the price. I think this product is really a niche for a certain user group, and not really exciting outside of that need.